MMO Tool v1.0.0 is a small application for windows computer created by Mamdouh, which allows you to remove FRP Protection and Screen Lock from Samsung, Huawei, HTC, LG and Xiaomi Smartphones and Tablets. It also allows you to remove Mi account from Xiaomi Smartphones. 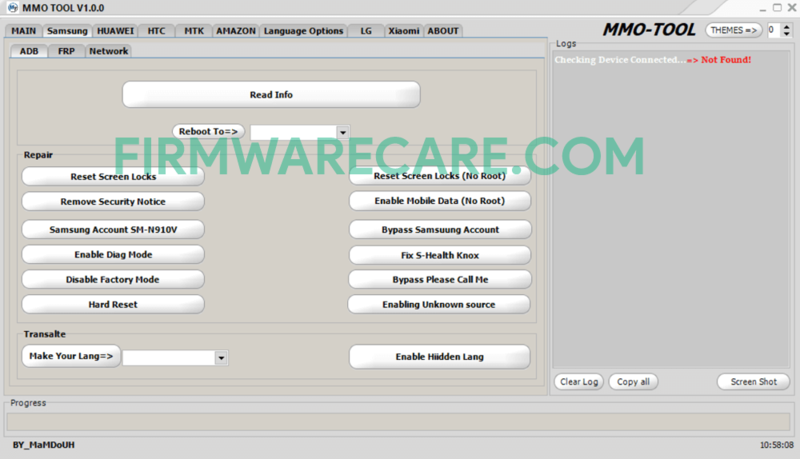 MMO Tool v1.0.0 comes with several functions such as Reset Screen Locks (No Root), Enable Mobile Data (No Root), Bypass Samsung Account, Fix S-Health Knox, and many more. It also allows you to Enable Hidden Languages on your Smartphones and Tablets. The other features of MMO Tool v1.0.0 includes Reset Screen Locks, Remove Security Notice, Enable Diag Mode, Disable Factory Mode and Hard Reset. Since, MMO Tool v1.0.0 is an open source tool. You may use it free for always. In order to use the MMO Tool, you need to install the Universal ADB Driver on your computer. [*] Compatibility: The MMO Tool runs perfectly on Windows XP, Windows Vista, Windows 7, Windows 8, Windows 8.1 and Windows 10 (32 bit and 64 bit). [*] Credits: MMO Tool is created and distributed by Mamdouh (developer). So, full credits goes to Mamdouh (developer) for sharing the tool for free.